Collecting airline miles can be a pain. Even if you provide your frequent flyer number at time of booking and present your frequent flyer card at check-in, a lot of airlines still manage to screw up and leave you with 0 miles. If you notice a flight was not credited to your miles account a few weeks after your trip, submit an online claim. If you’re lucky, the miles are credited to your account a few days later. Unfortunately, in most cases you’ll get an email stating your online claim failed. You will be requested to use old fashioned snail mail to send your e-ticket and the corresponding original boarding passes to the frequent flyer program’s office. Lesson number 1: Always keep your boarding passes. It’s that easy to lose piece of paper with your seat number you get when boarding the plane. After you snail-mailed your boarding passes, the waiting game starts again. You better make an entry in your agenda to check if your miles have been posted on your account. In my case I had filed a claim for two return trips to Bucharest, sold by Brussels Airlines (Star Alliance) as a codeshare flight (it had a SNxxxx flight number) operated by Tarom (Skyteam) The reason I booked this Tarom flight via Brussels Airlines was the indication on BrusselsAirlines.com I would earn miles. Since I’m a Miles and More Frequent Traveler (*A silver) I could also use the business lounge at Brussels Airport (at Otopeni airport, I was rejected at the Business lounge “We don’t have an agreement with Brussels Airlines Sir“) For your info, Miles and More is the frequent flyer program of Brussels Airlines ran by their flagship Lufthansa. Today, more than a month after my original online claim and trip to the post office to ship boarding passes to Germany, I received a letter from the Miles & More Service Team. We regret that we cannot comply with your request in this instance. Miles are allocated under the flight number of the operating carrier. If it is a Star Alliance Partner, you will also receive status miles. However, if a partner does not offer miles for a particular route or if the airline that flies you to your destination does not participate in Miles & More, your claim for credit will be rejected – regardless of the flight number that is printed on your ticket. Why does your website show one would earn miles on these Tarom operated flights? Why does your online claim department ask me to waste my time driving to the post office to ship boarding passes even if it was clear from the beginning these were Tarom operated flights? How many other non Star Alliance partners have the ‘Miles’ icon in the features column on your website? Or do you expect your customers to understand “Miles credited on your account by partner airline may differ” in fact means 0 miles? 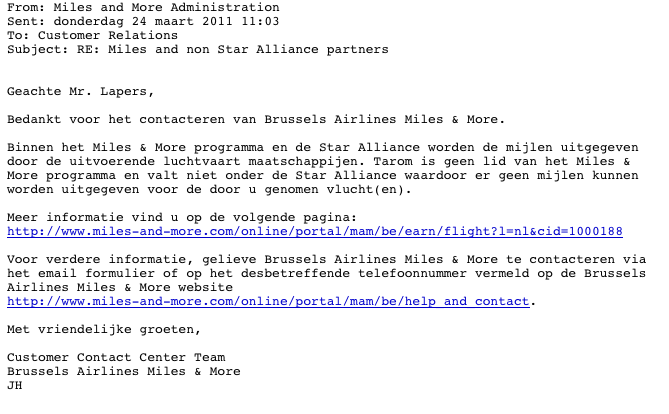 Summary of the email: Tarom is not a member of the Miles & More program nor a Star Alliance member, so my Tarom flights are not eligible for miles. OK, but why does BrusselsAirlines.com have the MILES icon on their sales pages for Tarom flights?!? The above email was sent by ‘Miles and More administration’ and signed with ‘Customer Contact Center Team – Brussels Airlines Miles & More’ . The second part of the email is really confusion. ‘For more information, please contact Brussels Airlines Miles & More via email form or by phone. More details on the Brussels Airlines Miles & More website.’ Euh? Above: Brussels Airlines response on my blog post via twitter (account @FlyingBrussels) I’ll keep an eye on the BrusselsAirlines.com website to verify if the miles icon for non eligible flights is removed. and I thought this only happened to me in so many areas of life these days. Employees simply do not think and just rattle of standard responses and do not want to make even a little effort. I avoid Brussels airlines at all costs… they have a really “cheap” service during the flight, where one has to pay for almost everything that other airlines offer for free (and there is no difference in the price of the tickets with other airlines). Apart from that, Brussels was the only airline that gave me such an issue with miles as the one described in your post, while it was a share code flight with Aegean Airlines (which IS a Star Alliance member), if I recall well, as it has been quite a long time. I am a Gold Star Alliance member now but I think I deserve better than what Brussels Airlines offers (same goes with Alitalia and other airlines).